There were a number of excellent artists who made significant contributions to the history of art related to Nebraska, but for various reasons, many have been overlooked, neglected, or given little notice by historians and art museums until recently. Better known than many artists in this category, Jules Tavernier was an artist who was important as a newspaper illustrator and painter of western landscapes and Native American culture. Tavernier was born in Paris to an English father and French mother. Because he had to take his father’s nationality, he could not study at Paris’ École des Beaux-Arts and instead trained in the private atelier of Felix Barrias, a master teacher at the Beaux-Arts. Tavernier painted with the Barbizon artists and exhibited for four years at the Paris Salon, then was a foot soldier in the “Artists’ Battalion” during the nine-month Franco-Prussian war (1870-1871). After the war, he was an illustrator in London before going to New York to work for the New York Graphic, and later Harper’s Weekly. Harper’s teamed him with another French artist, Paul Frenzeny, to tour the American west in 1873 and 1874 and to illustrate the less traveled areas for the newspaper. Tavernier and Frenzeny traveled by horseback across Kansas to Colorado, then to Texas, back to Denver to spend the winter, and on to Wyoming at Fort Laramie in the spring of 1874. From there Tavernier went east along the Oregon Trail to western Nebraska near the Chimney Rock area, then north to the Red Cloud Agency near present-day Fort Robinson. Although Tavernier spent only two months in the spring of 1874 in Nebraska, he produced several significant works of Indian encampments, the Red Cloud and Spotted Tail Agencies, the sun dance, and landscapes of Nebraska’s Pine Ridge area including Crow Butte, and Chimney Rock on the Oregon Trail. Most of these artworks were produced in watercolor, pastel, and pencil sketches which he later painted in oil in his California and Hawaii studios. By the summer of 1874, Tavernier was in San Francisco where, for ten years, he painted the California landscape and his earlier sketches of western scenes. He married and was a popular “bohemian” in that city. Like his father, he had a conflicted attitude towards money, often not paying his creditors. In 1884 he joined several bohemian friends in Hawaii and became fascinated by the renewed activity of the Kilauea volcano, subsequently founding the volcano school of painting. He died there from alcoholism in 1889. The Museum of Nebraska Art owns three significant works plus other wood engravings by Jules Tavernier. The first is a 5 x 7″ watercolor titled Red Cloud Camp. The scene of supply wagons near the agency with the unique bluffs in the background was created on location, a direct experience of the Red Cloud Agency observation. Small paintings of this sort were intended by the artists to be reference materials for idealized works that would later be developed in the comforts of their studios. Today, historians consider these spontaneous, informal paintings to be important documents of the creative process and the artists’ powers of direct observation. It is one of the few known dated painted sketches by Tavernier. 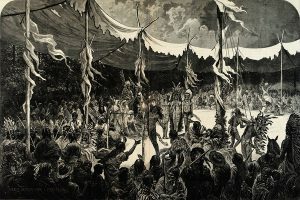 The second work is by Tavernier and Frenzeny who created a double-page wood engraving for Harper’s Weekly titled Indian Sun Dance – Young Bucks proving their Endurance by Self Torture. Tavernier had difficulty but in the end received permission to observe this ritual and was one of the first artists to record this spiritual event and have the scene published in a newspaper. Multiple copies were made in 1875, although rare to find now. The third work is an oil painting on canvas, 20½ × 35″, titled Indian Encampment. The scene depicts a Sioux village with a few individuals walking amongst several tipis covered by a recent snowfall in the spring of the year. The painting is a variation of an often repeated scene. The encampment was probably one of many Sioux villages that Tavernier observed from the present-day city of Crawford, Nebraska to more than three miles east to the Crow Butte landmark in Nebraska Pine Ridge country. It is a romanticized scene with a striking sunset typical of Tavernier’s studio western scenes. The Museum of Nebraska Art has three works by Jules Tavernier and six others by Tavernier and Paul Frenzy. Additional information provided by Claudine Chalmers, 2013.